Due to expected rain on Saturday, no lawn bowling lessons will be held on Saturday. We hope to see you on the green soon! Saturday, April 15 saw the 2017 Meat Axe Challenge Tournament held at the Palo Alto Club. 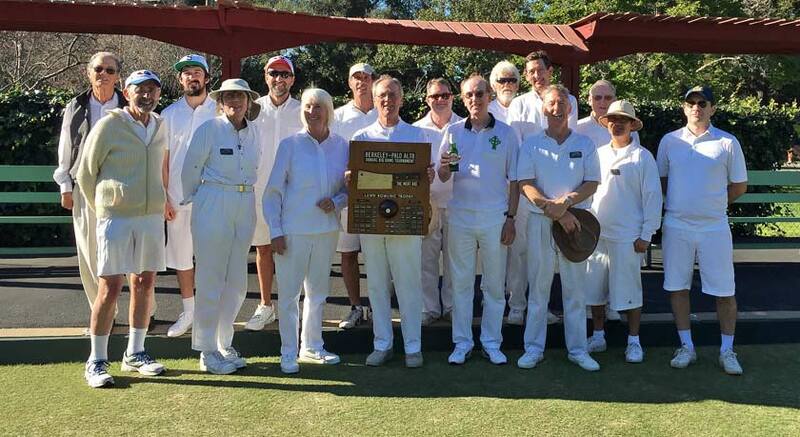 The annual contest pits Berkeley against PALBC in a match-up that has almost the intensity and rivalry of the Cal-Stanford game, except that this is lawn bowling rather than football, so is a bit more decorous. Long story short, although we fielded 6 strong Berkeley teams, all bedecked in the spiffy new Club colors, we were unable to hold on to the trophy that has hung on the Clubhouse wall these past two years. After two sets of six triples games (morning and afternoon), the overall result was 9-3 in favor of the spirited Palo Alto players. Accordingly, we had to hand over the cleaver until next year when the venue returns to Berkeley, and, hopefully, the trophy returns to its rightful home. 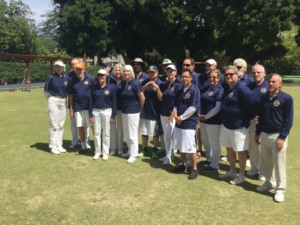 With appreciation to all BLBC members who participated and to the Palo Alto Club, which, as always, organized a fine sporting event. BLBC Team sports their new Club colors ahead of the 2017 Meat Axe Tournament in Palo Alto. Fifteen Berkeley bowlers made the trip to Palo Alto on Saturday, January 21st, for this year’s battle for the meat axe. Two triples matches were played under crisp, clear winter skies. In the end, it was Berkeley seven, Palo Alto 3 and the coveted trophy was returned to its rightful place in the Berkeley clubhouse. 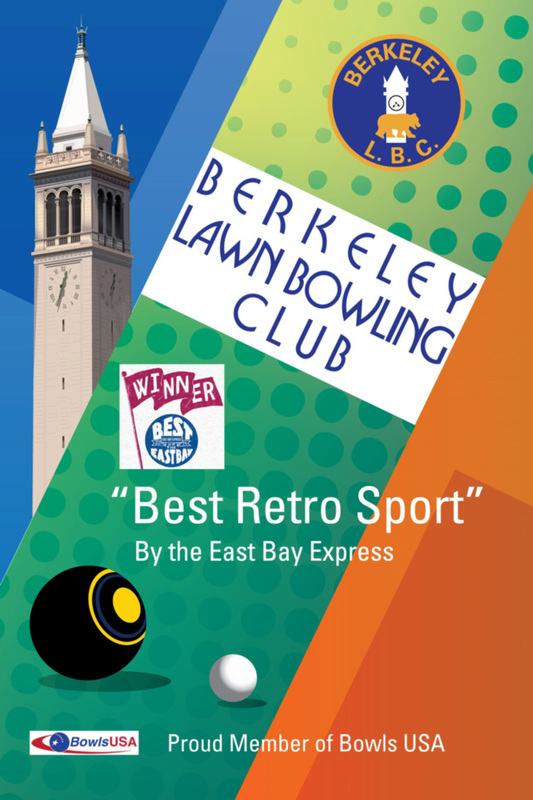 The BLBC is proud to announce that it has been awarded the 2014 Best Retro Sports Activity in the East Bay by the East Bay Express, the free weekly magazine of news and culture. We owe this achievement to the hard work of all who have contributed to the maintenance and promulgation of the Club, not least Dave Rockhold, who insisted we publicize our “retro” appeal, Cris Benton, who devised our snazzy new website that has drawn a lot of viewers, and Ann Brillhart, who has managed the campaign to get groups and companies to use the Club as a venue for parties, team-building sessions and so on. They have been ably assisted by many others, especially those who have devoted hours to coaching newbies, both “walk-ins” to our Saturday and Sunday lessons, as well as the groups, sometimes 50 or more who have enjoyed the Club’s facilities. To further publicize our status, we have had local graphic designer, Ian Ransley, create a great new Club poster (pictured), which will be prominently featured at our booth for the 40th Annual Solano Stroll on Sunday September 14. The Stroll is one of Berkeley/Albany’s “must” events of the year—a mile long festivity that includes food, music, fun stuff for kids, and many local non-profits. We will be in a prime location—just outside Andronico’s near the north end of Solano Avenue. Members are encouraged to show up (no need for “whites”), lend a hand if you can, but especially bring a non-bowling friend. The booth will be set up around 9/10am and will be staffed throughout the day until the close of the Stroll at 6pm. FREE LESSONS SATURDAY & SUNDAY, 10 UNTIL NOON. We provide the equipment; all you need is flat bottom shoes. Just drop by. Classes also available by appointment – Call Jim at 510 644 2249. 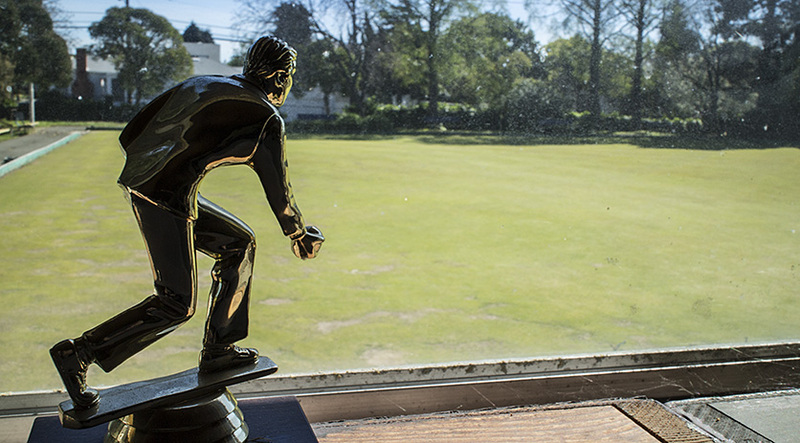 Outdoor bowling on a bowling green is a classic sport that goes back hundreds of years and continues today in Berkeley. The retro sport we love is modern day fun out in the fresh air. Walt Disney was an avid lawn bowler. Please, stop by and check out the action be it lessons or just to watch on Wednesday or Friday afternoon. EVERYONE IS WELCOME! Already know how to bowl? 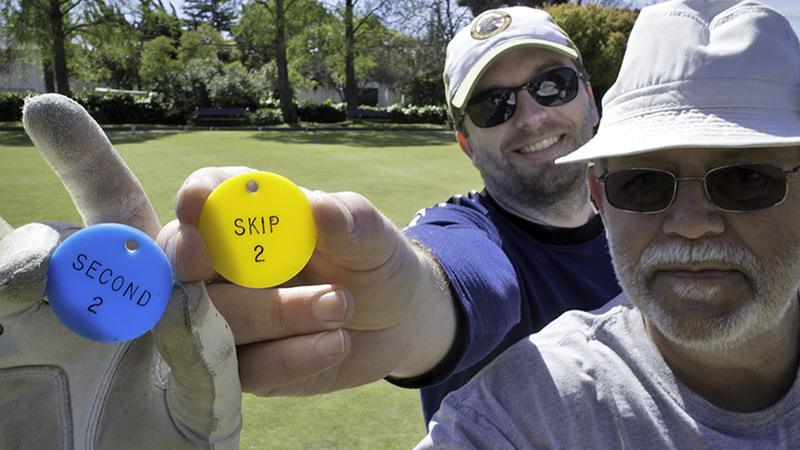 Day use fees for lawn bowling are just $5 per day for Berkeley residents and $5.50 for non residents. Phone (510) 841-2174. Draw games for members and guests are normally held on Wednesday and Friday. Please arrive or call by 12:15. Games begin at 12:30. Spontaneous draw games, practice sessions, and special sessions have become quite common. If you are interested in having your own special event at our facility, please contact us or drop by during one of the draw games. Our facilities can accommodate around 50 people for receptions, meetings, or team building events. We can provide bowling instruction or simply a rental venue with cooking facilities. Check out our tongue-in-cheek video for a quick look at lawn bowling Curling (without the ice) Check the links page for even more information. BLBC is a proud member of PIMD (Pacific Intermountain Division) of Bowls USA. This is a POST placeholder to make the PAGE version of Coach’s Corner work in the featured content area. If you are editing, do not change this POST, go to the PAGE version instead.